An Accurate Map of the West Indies, from the Latest Improvements - Wilkinson, R.
Title : An Accurate Map of the West Indies, from the Latest Improvements. Map maker : Wilkinson, R.. Size : 7.2 x 9.8 inches. / 18.3 x 24.8 cm. 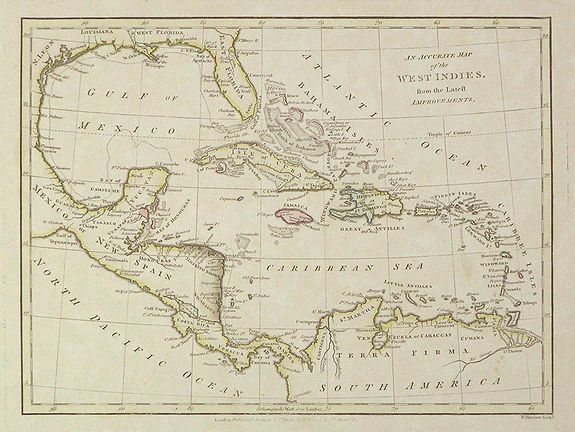 Description :Nicely engraved small map of the Caribbean from the respected English map publisher Robert Wilkinson. Shows banks and shoals, capes, bays and coastal settlements. Colored coastlines show Spanish, French and British possessions. Condition : Very Good, with a few light spots lower right.